Many thanks to Claire McAlpine, who tagged me in a Five Favorite Books challenge, which I’m to pass on to five other bloggers. Here goes, but before you read on, be sure to visit Claire’s delightful blog, Word by Word. Claire, who lives and works in the south of France, is a prolific, passionate reader who never fails to inspire me when I’m wondering which book to read next. 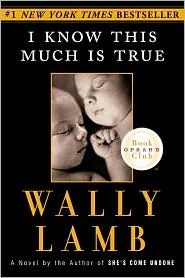 I Know This Much Is True, by Wally Lamb. I’ve read all of Lamb’s novels, but my favorite is I Know This Much Is True, about twin brothers, one with schizophrenia. Dominick Birdsey is an unforgettable character, and so is his brother, Thomas, who battles the demons of serious mental illness. My mother had schizophrenia, so for me this book is especially meaningful. Lamb’s portrayal of the illness is spot on. I Know This Much Is True blends comedy and tragedy as Dominick soldiers on in the difficult odyssey that is his life, the kind of real-life struggles we can all identify with. You just won’t want to stop rooting for Dominick, and I, for one, couldn’t stop reading until I found out whether he would end up with the love of his life. 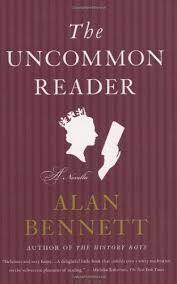 I was taken with the darkly comic opening involving a librarian who has an especially trying day. (I read this before I knew I was going to become a librarian.) Check out Wally Lamb on Facebook. He’s a generous, down-to-earth author who loves talking with his readers. In October, 2013, Lamb will publish his newest novel, We Are Water. In this video, Wally Lamb tells how We Are Water came about. Listening to his story will make you want to get the book, which I’ll be writing about in a future post. Jane Eyre, by Charlotte Bronte. I’m a romantic, partial to female gothics, and there is the undercurrent of madness, which “transfixes” me (as Mr. Rochester would say). I read this in high school and have been fascinated and mystified by it ever since. Has anyone seen the most recent movie incarnation? I thought Mia Wasikowska and Amelia Clarkson (young Jane) were fabulous. And Judi Dench, of course. When We Were Orphans, by Kazuo Ishiguro. When I was looking for a hyperlink to When We Were Orphans, I was surprised Wikipedia authors say it is regarded by some as Ishiguro’s weakest book. I don’t see that at all. For me, it eloquently captures childhood loss and its lifelong consequences, and there’s also the fascination of Ishiguro’s typically unreliable, self-deluded narrator. Except in this case I think the narrator comes to a sad, more realistic understanding of himself and the world. I’ll say no more since I’d like to write further about this book in the future. Plainsong, by Kent Haruf. I loved visiting this small Colorado town and meeting the simple, kind, and decent people there. It does my heart good to know there are writers like Haruf creating fictional worlds like this one. I was swept away by Plainsong and the sequel, Eventide. Haruf makes writing look easy, but this sort of simplicity isn’t easy at all. I’ve not had the pleasure of reading his newest book, Benediction. Can’t wait. I’ll be sure to write about it here. 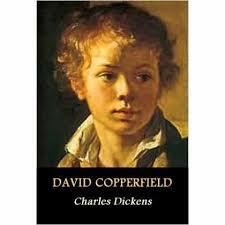 David Copperfield, by Charles Dickens. I read this in high school, too, and haven’t read it since then, so I want to revisit it sometime soon. Another deprived childhood story. (Do you see a trend here?) After I read David Copperfield I felt I’d lived an entire life. This is a great book to read when you are young and just starting out, and then at least once again when you’re looking back. I believe there was a PBS version that aired in the dark ages when I was reading the novel. It, too, was wonderful. A Leaf in Springtime Sheer exuberance in writing and photography, by Sharon, who is Chinese (born in Malaysia) and now living in Finland. The Hiker Mama I love the Pacific Northwest, and I wish this blog had been around when we were hiking with our sons. Jennifer and I had the pleasure of taking a class together taught by Christina Katz. Fine Little Day Because I’m half Swedish and I love fabrics and country houses and all sorts of beautiful domestic things. 66 Square Feet A tiny terrace garden, seasonal living, cooking in New York City, and travels to South Africa, by Marie Viljoen. Just beautiful, reminds me of my big city days. Flowery Prose Plants, veggies, flowers, gardens, the outdoors, and lots of fascinating information about all of these.